I was talking last week with Tony Karrer, a sharp guy who runs TechEmpower, which does some very interesting things with technology beyond elearning such as linking competencies with interventions and tracked back to performance. Naturally, he’s also the author of the eLearningTech blog. Among the things we discussed was the problem in talking about what we do. eLearning, a great phrase at the time, has some problems. It can easily be perceived to be focusing on the formal learning part, ignoring informal learning. And it doesn’t convey at the C-level that we consider the broader possibilities of how we can link technology to facilitate organizational innovation and knowledge worker effectiveness (and efficiency). Marc Rosenberg‘s captured part of it in the notion of Beyond eLearning, but that’s a perspective, not a categorical phrase. However, I’ve yet to come across a better term. Performance Support, while a great concept, can get confused with other forms of organizational performance. Human Capital Improvement just doesn’t resonate, sounding more like Fredrick Taylor-style time and motion studies than knowledge worker empowerment. Even what I just said “Knowledge Worker Empowerment” sounds more like a social movement than a targeted design approach. When I talk about moving up the eLearning Value Chain, the top end is far beyond eLearning (e.g. the Performance Ecosystem). Yet I don’t have a better phrase! Neither Tony nor I think our solutions are just an HR issue, but instead involve crossing silos to provide overarching solutions that are directly linked to operations and revenue. It’s a marketing thing, but an important one I think. We’re already having trouble selling beyond the HR group, and I think the phrase eLearning still gets bucketed into that ‘cost center’ mentality. We need to be about effectiveness, not efficiencies. A phrase that’s forward looking, not loaded with baggage (as performance support, knowledge management, elearning, and most others are). Any ideas? Can anyone think of anything besides holding a nationwide competition? Is it a topic for Learning Circuit’s big question? Help! I’m pleased to say that my article on 7 Steps to Better eLearning is now out in eLearning Mag. Have a look and let me know what you think! So, what will I remember most about 2006? Probably that it was the Year of the Game. Gaming became mainstream (we moved it out of the ’emerging’ track at TechKnowledge, for example). Whether called Serious Games, Simulations, Scenarios, or whatever, it’s definitely crossed the chasm. That’s not to say it’s ubiquitous, or even well done yet, but it’s definitely playing a role in many more organizations, and it’s on more people’s radar. It’s also been a year of more strategic use of eLearning. 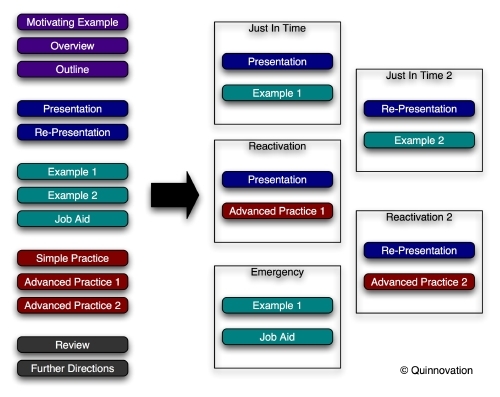 The progression on my models page is one way I’ve been thinking about it (feedback welcome), but increasingly I’m seeing folks interested in road maps to address organizational performance by leveraging their IT investment in more intelligent ways, not just purchasing an LMS and acquiring content to meet training needs. The biggest challenges will be executing successfully to take eLearning to the “next level”, whether it’s tactics like improving the instructional design or adding eCommunity to strategies about changing the customer role. It’s too easy to take half-baked approaches: have one workshop run, or engage one improvement initiative without applying the organizational change implementation thoughts that accompany these initiatives. It’s also important to focus on the goals, not the tools. Getting the design right is the hard part, not figuring out what technology implementation can render the design. My predictions for 2007 are first that mobile learning will cross the chasm like Games have. It’s on the cusp, and I’m hearing lots of different buzz going around. The capabilities are pretty mature now, and the integration is now possible, so that we have a whole new set of affordances or capabilities that provide some real performance opportunities. I also think that the hype will go off podcasts and blog and wikis as phenomena, and they’ll take their rightful place as power tools in our suite of resources. This is not to diminish them in the least, they’re valuable tools at the higher level for collaboration and communication, but we’ll start looking at the larger picture, about why we need collaboration and communication and start developing systemic approaches, not experimenting with them as one-offs. We’ll see greater awareness of the necessity of what I call performance ecosystems and Jay Cross has termed ‘Learnscapes’ (a nice term, I may have to adopt it). We’ll start seeing a recognition that individuals need a unified and richly populated playground with all sorts of resources and ways to extend our understanding and our capabilities. And I fervently hope we’ll begin to recognize that we can’t assume that if we build it, they will learn, but we have to develop a learning culture, that we need to develop our learners’ ability to learn, that we have to recognize, take responsibility for, and foster meta-learning (learning to learn). While this is not my last message of the year I hope, this is a great opportunity to thank everyone for a very interesting year, and send my best wishes that the coming year be the best yet for all of us. Jimmy Atkinson passed on this list of 77 Ways to Learn Faster, Deeper, & Better. Maybe he knows I’m keen on meta-learning, or learning to learn, and there are some nuggets in here. No one’s suggesting, I’m sure, that you should go for all of them, but you might want to graze the list and incorporate one or two into your existing approaches. Being a better learner is one of the key differentiators, going forward (it’s part of my curriculum, which I discussed previously). I admit I haven’t scrutinized the list in fullness, though I might add “engage yourself”, that is, finding your own ways to make the content meaningful if the instructor hasn’t, such as creating examples where it would be important to you. Still, having more guides to becoming a better learner is a ‘good thing’ (see also Marcia Connor’s Learn More Now). Learn on! I haven’t received Jay’s Informal Learning book yet (he’s promised it’s coming) but I’ve been thinking about informal learning a lot lately, not least because it’s emerged as an issue in some recent elearning strategy engagements. One of the issues is the transition from novice to expert. 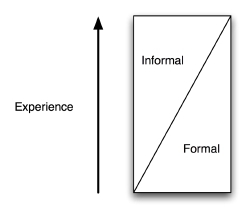 I think Tony O’Driscoll’s model captures it elegantly, how the role of formal drops off and informal comes to play a bigger role as you transition from novice to expert. At the expert level, collaboration that is the knowledge negotiation process can be handled by email, blogs, and wiki. The problem is having the learner becoming part of the community from the beginning. I’d like to insist that it be baked into the LMS infrastructure, but I think instead that our elearning needs to be designed with communication and knowledge representation into it even for the most formal courses. Which, of course, is hard to think of when you’re taking the typical siloed view of content and designing independent asynchronous courses. Which is why I’m arguing for a performance focus for organizations. For example, the learning follow-on systems touted by Will Thalheimer, the example Jay Cross posted about where a new app emailed him several times over several days with further tips, and my own ‘layered learning’ model for slow learning. Along the same lines, in a couple of recent engagements I’ve been suggesting that customer help needs to have a single entry point, with self-help resources and then an obvious and steady progression forward through getting assistance if the answer doesn’t already exist (ala my Learning At Large paper, PDF). The points being that we need a broader focus, and our instructional design has to be augmented with information design and information architecture. It’s about supporting performance, not just about courses. but it’s a representative set. At last! Joining, once again, the Learning Circuit blog’s big question of the month, which this month is “Are ISD / ADDIE / HPT relevant in a world of rapid elearning, faster time-to-performance, and informal learning?”. A fun thing that they’ve started. My initial short answer was, of course, “yes”, but continued “but not the same ISD/ADDIE/HPT”. We need a design process. Without knowing what we’re trying to achieve, metrics that let us know how we’re doing, and ownership of the outcomes, among other things, you don’t have any idea what you’re doing. However, it’s not always going to fall into either a course or a job aid. There’re more solutions under the sun than are dreamt of in the philosophies that led to those old approaches. You need a recognition, as Tony O’Driscoll has elegantly articulated, of the way support needs change as a learner moves from novice to expert. When do you provide community instead of content? You need a recognition, as Jay Cross is suggesting, that many times self-directed learners may be better served with information resources than with courses. You need a recognition, as Marc Rosenberg tells us, that knowledge management and other areas are part of our responsibility of meeting performance needs, not just skill needs. And you need a recognition, as I’ve argued, that you can’t assume self-directed learners, so your learning design might include objectives of creating self-directed learners while addressing the obvious gap. And a recognition that, a barrier that may appear to be a knowledge/skill gap may really be an attitude gap, or some other hurdle. In addition, our capabilities have changed, and we have new opportunities that we didn’t have before, such as layering little bits of knowledge around and on top of or the events in our life to use those as practice opportunities and not having to simulate them in an artificial course (an approach I’m calling layered learning, part of my ‘slow learning’ movement). This is a mobile affordance, but we also have some webservices affordances (e.g. Web 2.0) to do much more customized learning delivery, and more. So we need a systematic process, but we need a broader perspective. We should keep our feet firmly planted in the ground of what’s known about how people learn, and recognize what makes an effective process. Sometimes the approach will look like the output of ISD, but other times it may be considerably different. Whether we continue with the moniker’s of ISD/ADDIE/HPT, or use a term like ‘cognitive design’ or ‘learning design’ (what I call what I do) to overthrow the baggage and limitations of those approaches, is a different issue. I’ve been suggesting for a while that our labels are a barrier to our success, keeping us mired in limited approaches. As a bit of marketing (and when we’re selling our organizational value to the C-suite we need to market our benefits), training and instructional design don’t cut the mustard. Not that I’ve solved this; learning design is slightly better, cognitive design starts taking us far afield (and brings up some other bad images), performance system design might be misconstrued, etc. Yet somehow we have to broaden our perspective. I have to admit I wasn’t as familiar with comes closest, and ISPI’s definition (courtesy of Harold Jarche) sounds like what I’m talking about, but then why isn’t it better known? And the label isn’t compelling, to address those issues we’ve talked about above. So, process yes, old approaches no. When we have a course to develop, we might use ISD, but there’re lots of times we’ll want to consider other approaches.